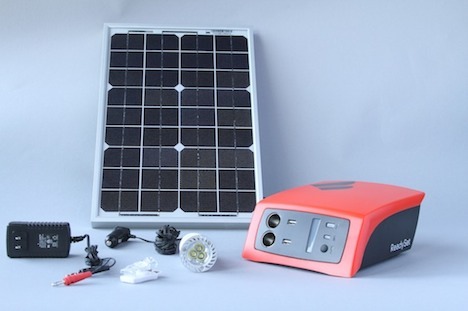 ReadySet Solar Charging Kit Designed For Africa Becomes Hit In U.S.
Brian Warshawsky and Mike Lin, founders of energy startup Fenix, have found themselves in quite an interesting business position. When they created a solar charging kit to help poor Ugandans start micro businesses, they had little idea the equipment designed to work in areas with no electricity would become such a hit among Americans as well. Turns out, the power system makes a pretty handy camping tool. The ReadySet charging kit has all the plugs needed for iPad, Phone battereis, laptops, and lanterns with two USB plugs, two car charger ports, and no proprietary plugs. It can be bike powered or grid powered, a very useful tool for areas with inconsistent grids. It is designed with the most basic needs in mind such as phone charging and providing minimal light for studying and reading at night. The guys had no idea their creation would be such a hit in tech-savvy regions, especially since it was developed to be durable enough for use in Africa, with just enough features to help potential entrepreneurs obtain basics such as light and small amounts of electricity. “It’s been particularly exciting to see our U.S. sales launch go so well on Kickstarter because we developed the ReadySet to be rugged and durable enough for Africa without the U.S. in mind,” said Lin in an interview with GOOD. A staggering 1.5 billion people around the world live without access to electricity. With cell phone use spreading faster than plug-in power, there are nearly 600 million people who own a cell phone but have nowhere to plug them in at home. Only one in three people have access to consistent electricity in Africa, so there is a huge market for solar energy gadgets such as this. Fenix has partnered with MTN, a Ugandan cell phone company wanting to make it easier for customers to use their phones. The company has sold about 2,000 of these solar charging units, with entrepreneurs charging about 25 cents a charge. Lin also made a great point that this is an example of “trickle-up innovation” since many Americans would love to get their hands on one as well. “While many Americans can’t afford an $80,000 solar array on their home, they do want to buy and support solar.” He added that “Succeeding in the U.S. will help us hire more engineers and sales teams, accelerate R&D, and grow to scale in Africa. It’s great to see innovative and clean tech products on the market that help bridge the gap between developed and developing countries. Would you find a ReadySet charging station to be useful in your life?